Dubai’s Emaar Properties, builder of the world’s tallest tower, reported a 36 percent increase in third-quarter net profit on Tuesday as revenue rose. The developer, in which Dubai’s government owns a minority stake, made a net profit of 1.15 billion dirhams ($313.1 million) in the three months to Sept. 30, it said in a bourse statement. That compares with a profit of 843 million dirhams in the year-earlier period. SICO Bahrain and EFG Hermes forecast Emaar would make a quarterly profit of 1.20 billion dirhams and 1.33 billion dirhams respectively. 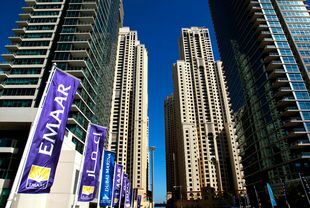 Emaar’s quarterly revenue was 3.85 billion dirhams, up 16 percent on the 3.33 billion dirhams recorded a year earlier. It launched on Sept. 5 a new project, a golf course district in the south of the emirate. Emaar plans to fund the project with a little equity, a little debt, and off-plan sales, Emaar chairman Mohamed Alabbar said at the time.